As a book selector and buyer, some books keep popping up in my line of view–some are easy for me to select for purchase and others take a little time to make that decision. Hillbilly Elegy was one of those books that kept being featured in publication after publication. This was clearly a book that caught the attention of publishers and magazine editors and book reviewers, but my question was whether it is a book that our Parkland readers would connect to. I finally added it to a purchase order and then forgot about the book–but it kept getting more and more attention so I dutifully placed a hold on our library copy and then read the book. Yes, this is a book that warrants the hype. First-time writer J.D. 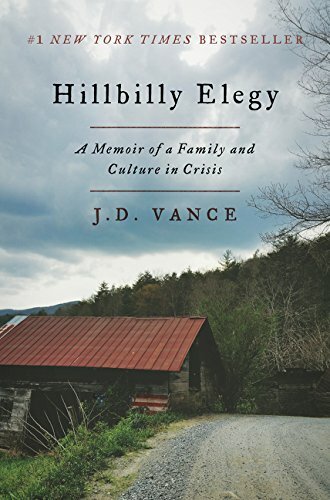 Vance has penned an important book that combines family memoir and a sociological reflection on working class America. Subtitled “A memoir of a family and culture in crisis,” the book is an exploration of why the author’s specific family reached a crisis point and also why his people are in crisis too. The book shows us how young J.D. gradually comes to understand who are his “people” and where he comes from. The cast of characters in the book is diverse and colourful to say the least. From brawling uncles, to pistol toting grandparents, to a drug addicted mother, and a revolving cast of dads and dad-stand-ins, our author explores the influences who have helped make him who he is today. The book is full of vibrant anecdotes and sincere attempts to understand the forces which have forged the Hillbilly character. Vance explores the good and the bad aspects of growing up in Kentucky and Ohio. What makes up the Hillbilly character, why does one family succeed when others fail, and what are the reasons why young J.D. both survived and thrived? Ultimately, J.D. gets to the point where he decides what forces will define him and which will not. I don’t want to give too much away because the book is a real adventure and one definitely worth reading. It has just been announced that the book will get further attention as Ron Howard’s production company has signed on to make a movie version of the book. As fine a filmmaker as Ron Howard is, do yourself a favour and read the book first!